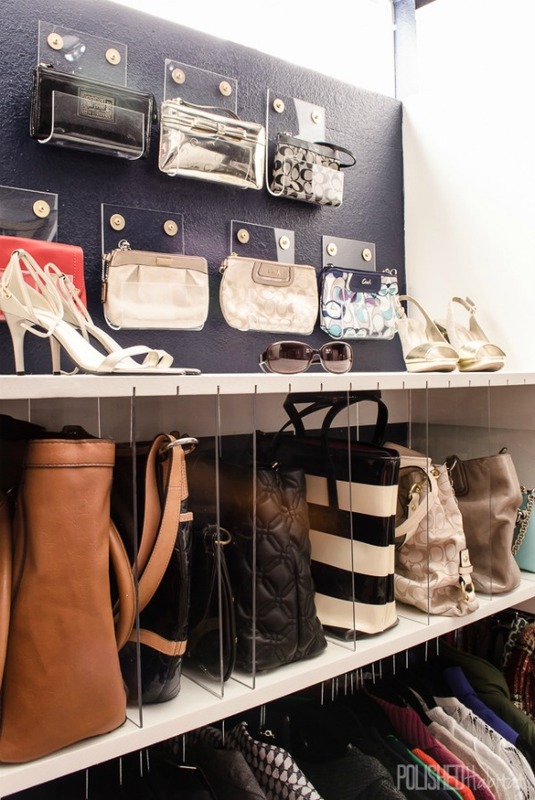 Are you looking to re-vamp your entire closet or just need some minor organizational help? We think you’ll love these ideas for either! 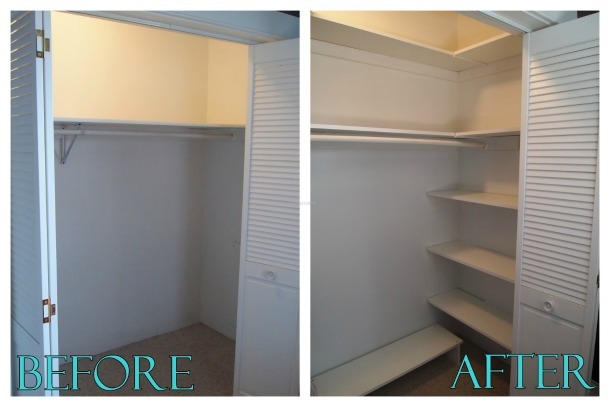 You won’t believe all of these clever re-purposing tricks and tips that you can use to make your closet function better! 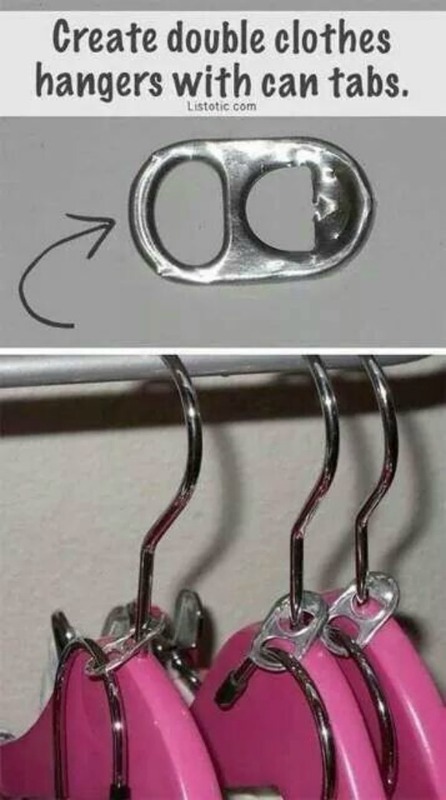 Check out how ‘S’ hooks can be such a helpful tool in hanging things as well as soda tabs! Do you have lots of heels? You won’t believe this simple fix to showcase them. 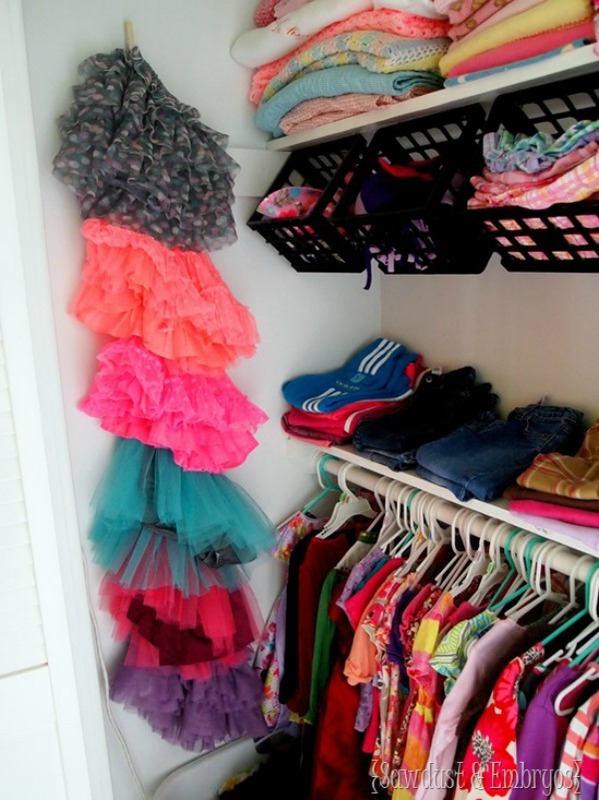 Enjoy making your closet your new happy place with all of these ideas! 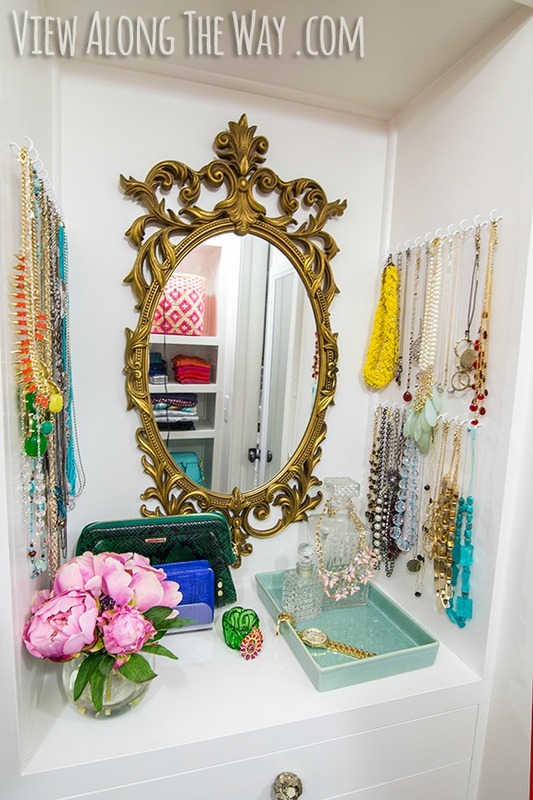 This girlie glam closet reveal is fun, we love these jewelry station for necklaces and such on View Along the Way. Even more useful from View Along The Way, check out these Slide Out Belt and Scarf Organizers. 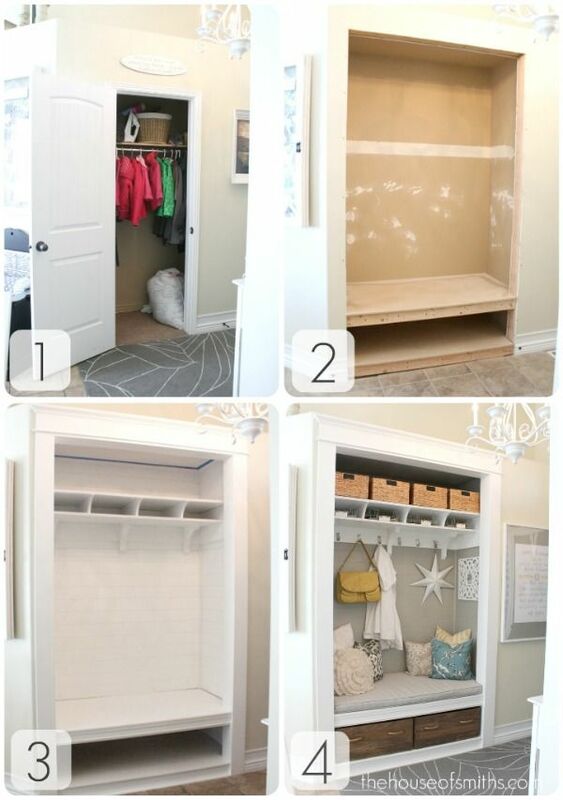 Consider taking a closet and turning it into a mud room from Hooked on Housing. Try making this Clutch Organizer from a Lid Rack like Fabulous Fashion for Sensible Style. Listoc Shares how to create a Double Hanger with Can Tabs. 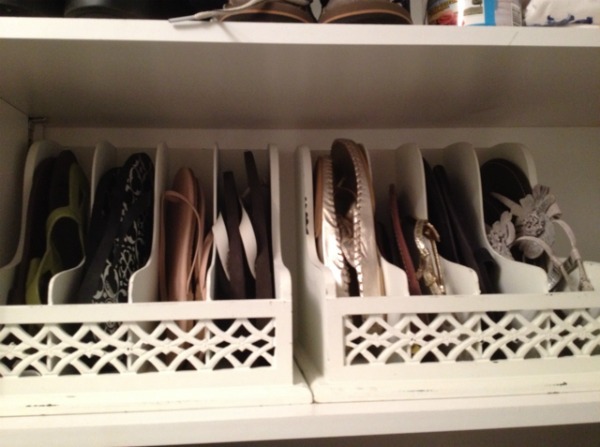 We love this Heel Shoe Organizer from Geniabeme. What a creative DIY craft. Another great way to organize shoes is by labeling them in a clear container like In My Own Style. A picture of the shoes on the label works great too! 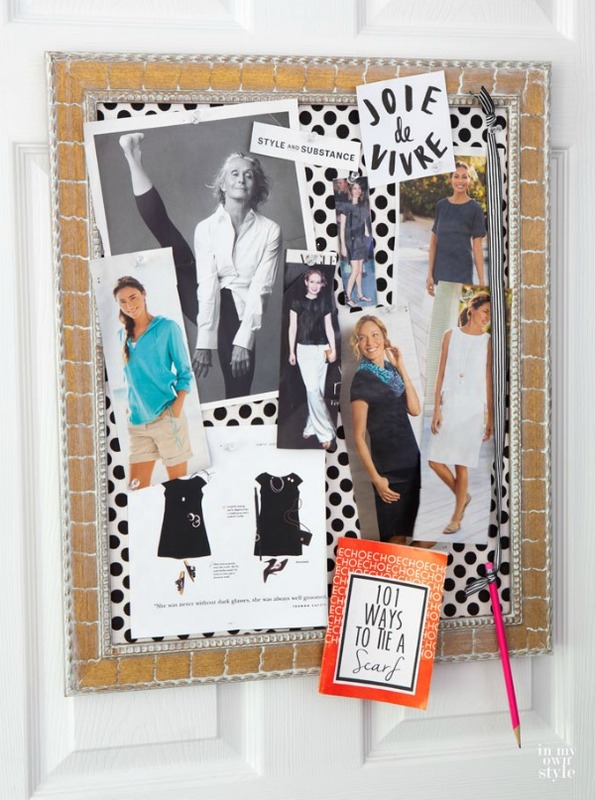 We love h0w In My Own Style has this inspiration board to help with looks and outfit creativity. 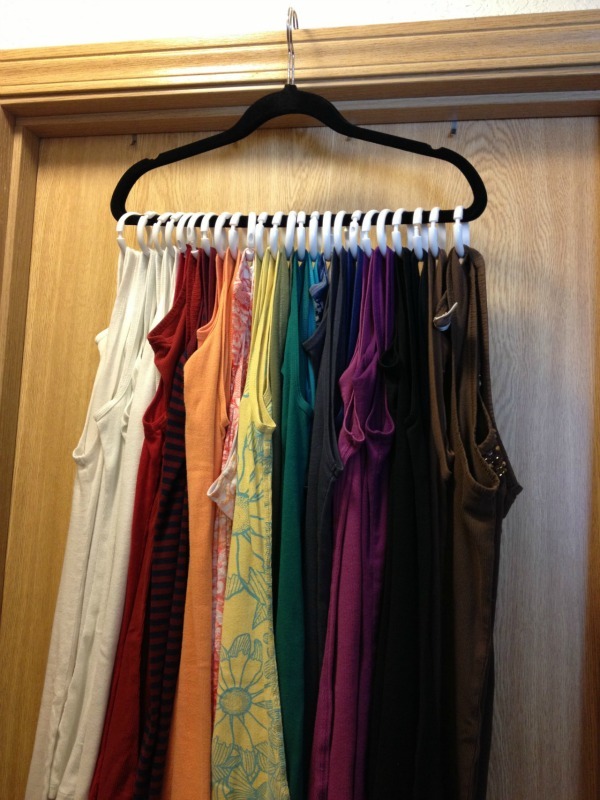 Hang Tank Tops with Shower Hooks like this idea from Storage Geek. 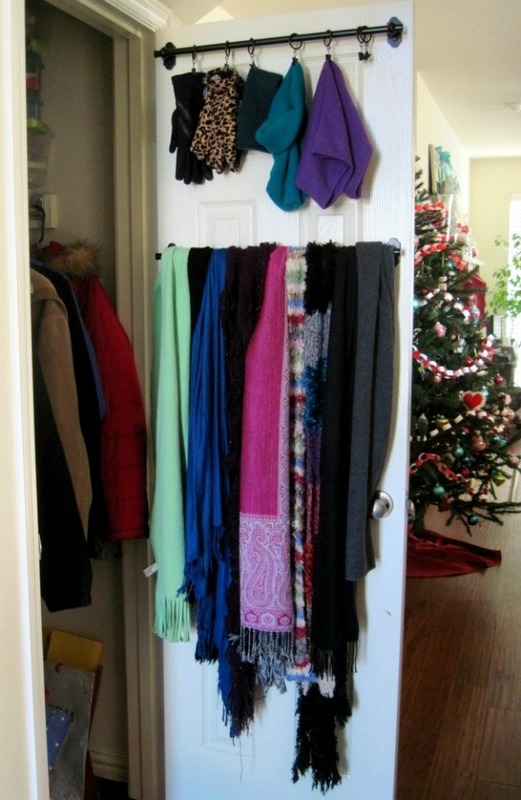 Try organizing tights (or scarves) on a hanger like What I Wore. 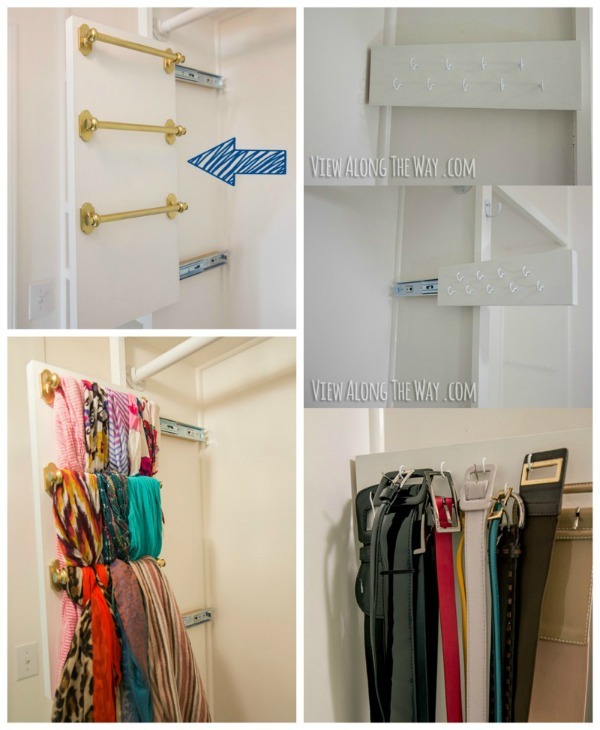 Add a rod on your closet door for hats gloves, scarves and more. Source unknown. Please let me know so I can credit properly. 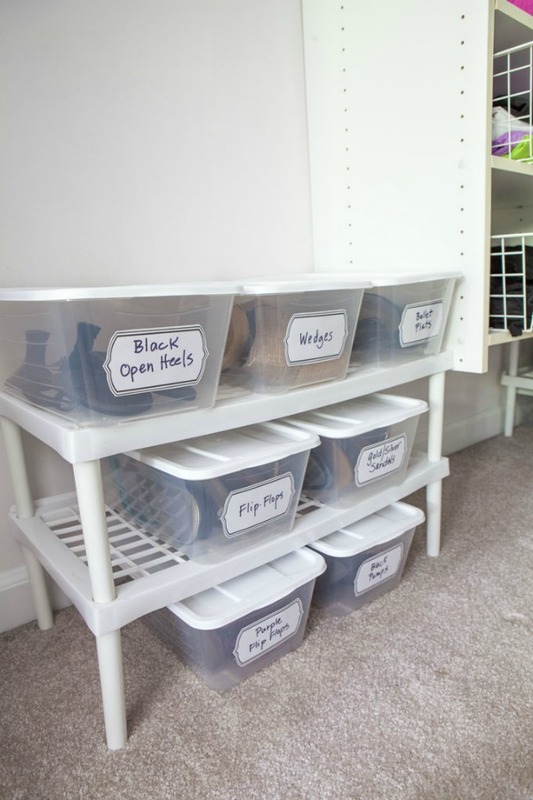 Try laundry baskets to help organize and add storage to a closet like Around the Farmhouse Table did for this baby nursery! 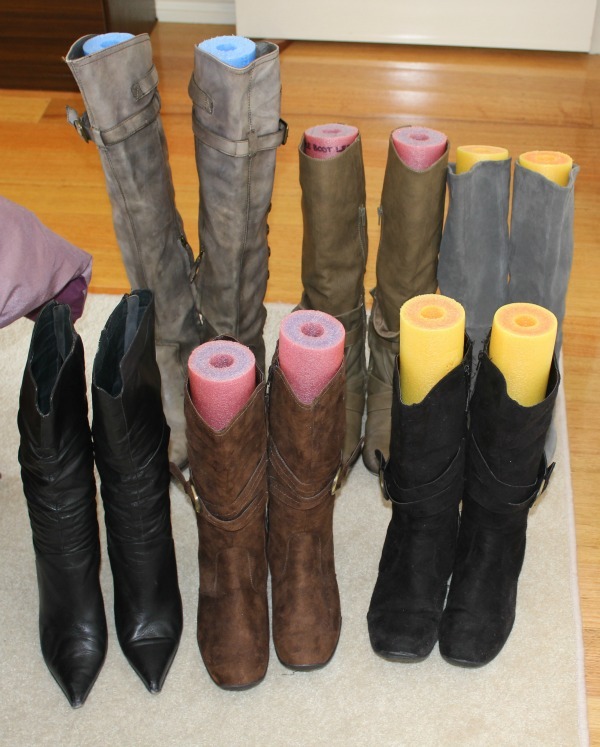 Keep your boots in good condition and from falling over with this Pool Noodle Hack from Angie’s Look Book. 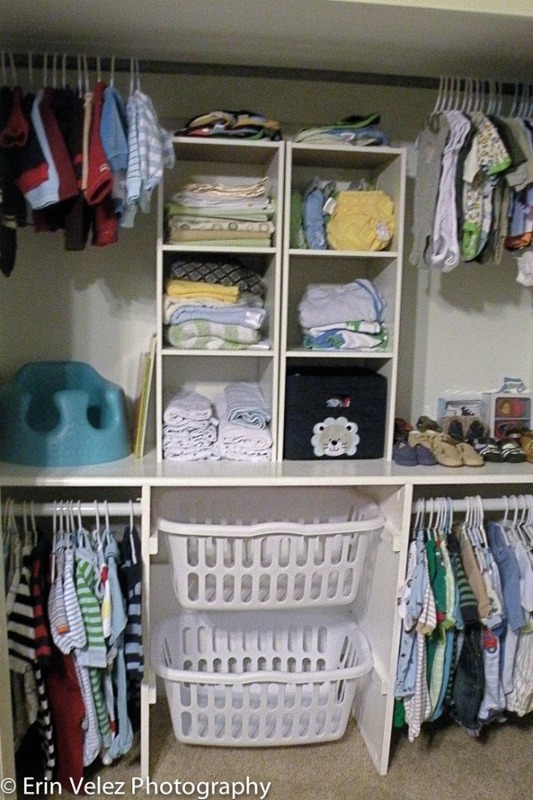 Use clothes pins to hang lightweight clothing like Saw Dust and Embryos. 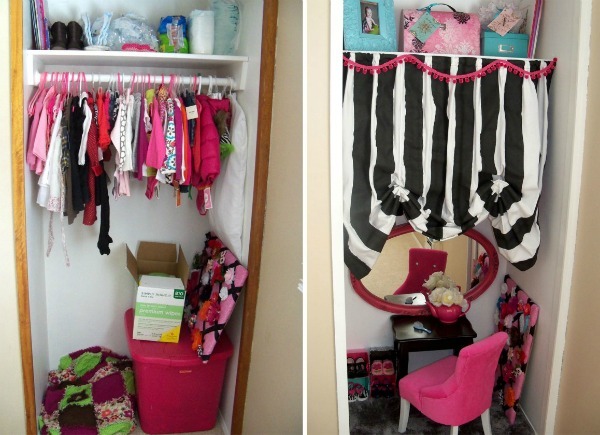 Turn an extra closet into a little girl’s dress up spot like Sister’s Suitcase Blog. Hide clothing with a curtain. 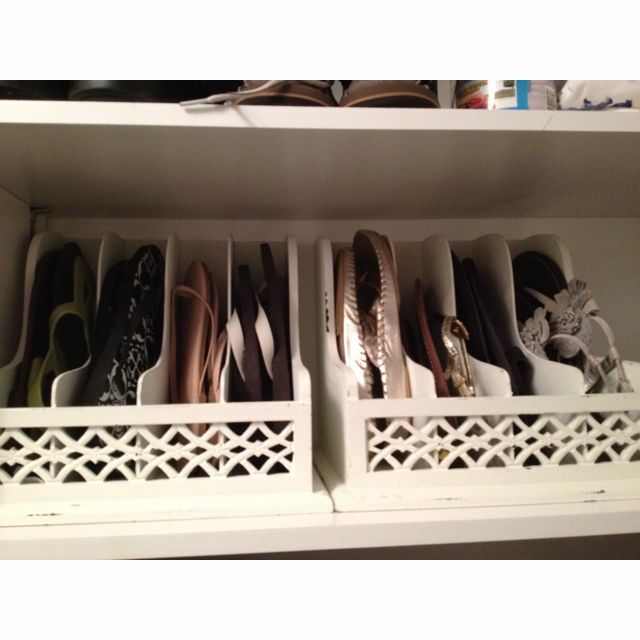 Organize your Flip Flops with a magazine or paper organizer. Source Unknown. 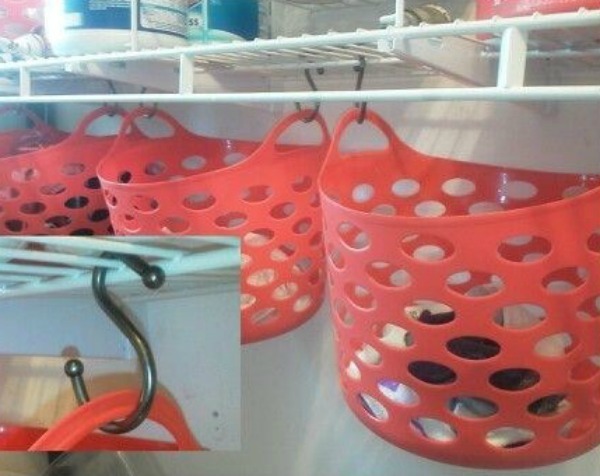 S Hooks and Dollar Store Baskets are great for organizing laundry or other small pieces of clothing. Tip from DIY Energy. Organize your Purses with Shower Hooks from Tart House. Have a systems for getting rid of clothes. 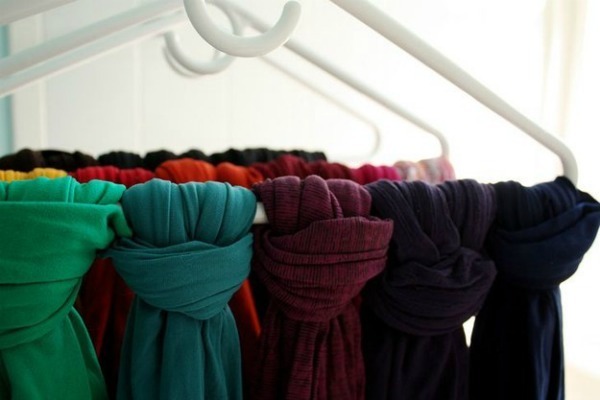 Turn all hangers backwards, when you wear something, hang it right side out. 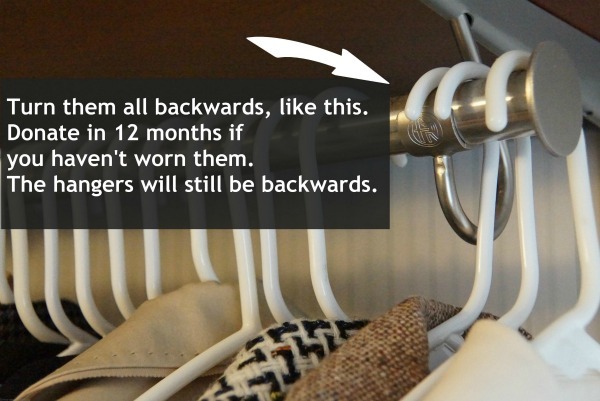 Get rid of all backwards hangers after 12 months. Tip from Tip Hero. Using Pipe Cleaners, make your own Non-Slip Hangers like In My Own Style. We also love this no-slip tip from Brizzleleo. 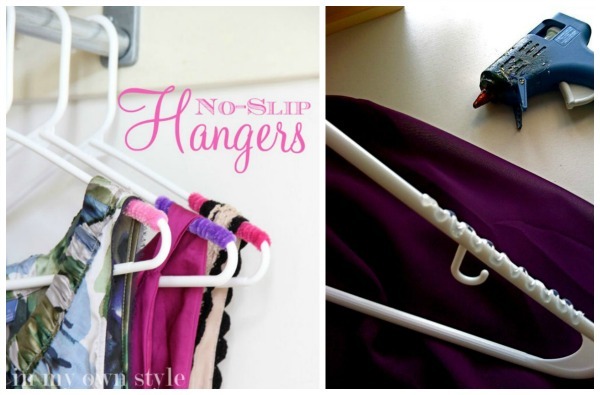 Use a hot glue gun to create a no-slip hanger. Polished Habitat has a beautiful re-organized Master Closet, take a look. 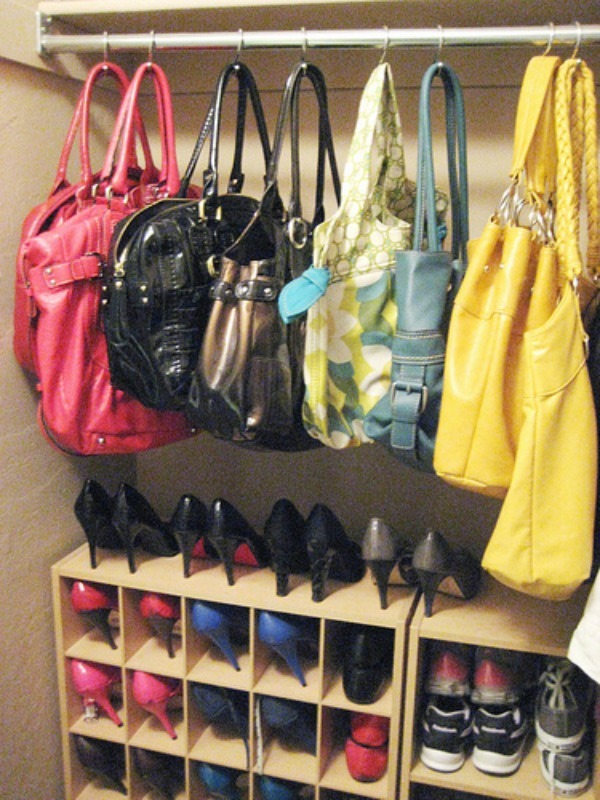 We love this organized clutch and purse section of her closet. Those clear dividers move! 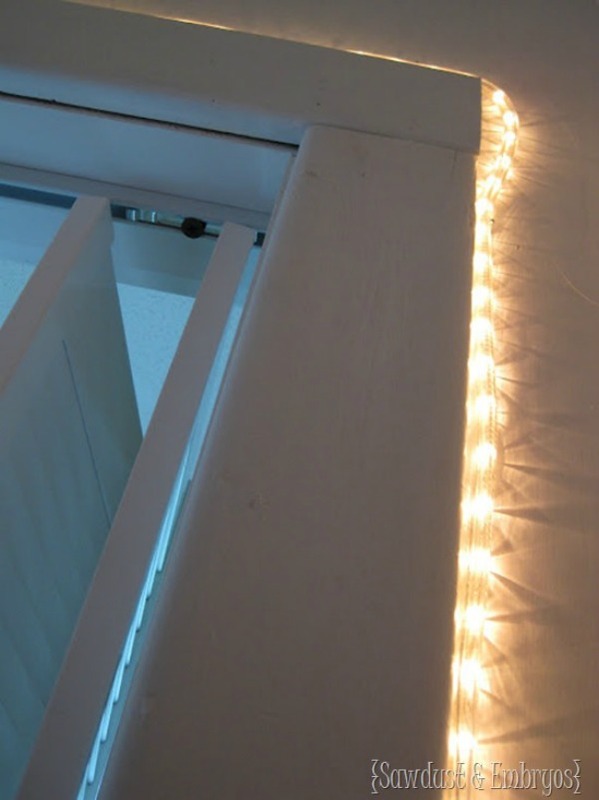 How creative is this rope lighting on the inside of a closet from Saw Dust and Embryos. 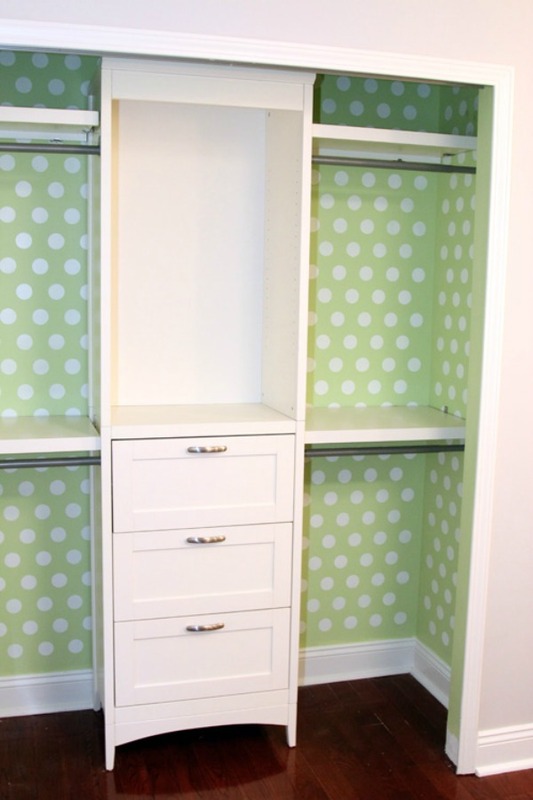 Try wallpapering a closet for character and to hide scuffed walls like the Lil House that Could. 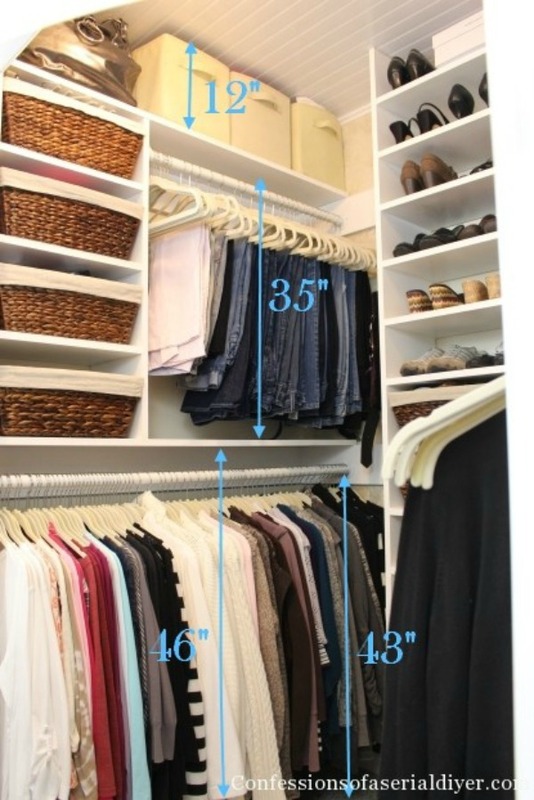 Measure your closet to maximize your space like Confessions of a Serial DIYer. Do not waste space, create side storage like Saw Dust and Embryos. Take a look at these Create a Gallery Wall – Ideas for Picture Frame Displays. Pin to Pinterest. 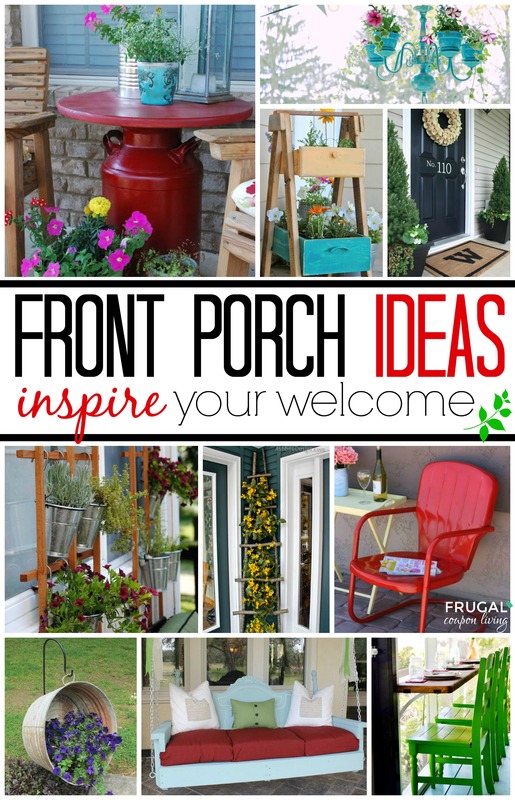 We love these creative Front Porch Ideas (inspire your welcome!) – Pin to Pinterest.